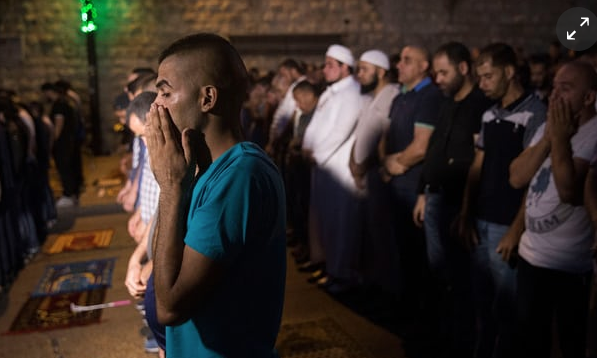 Israeli officials have said they will not remove metal detectors from outside a Jerusalem mosque, despite their installation triggering rapidly escalating confrontations with Palestinians. Amid a mounting toll of deaths and injuries in the crisis, Israelis and Palestinians are braced for weeks of confrontation, as both sides appeared to dig in to their positions. 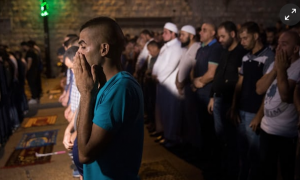 In addition to the metal detectors, Israel has also began installing sophisticated security cameras at one of the entrances to the compound housing the al-Aqsa mosque, known to Muslims as the Haram al-Sharif and revered by Jews as the Temple Mount. Security officials told Israeli media the cameras were intended to complement the metal detectors, not replace them. Despite the remarks – and with Israeli generals warning the violence may spiral – other officials appeared to offer a contradictory message, saying the Israeli prime minister, Benjamin Netanyahu, was considering alternatives to the walk-through sensors placed at entrances to the al-Aqsa mosque compound after two policemen were shot dead there on 14 July. The mixed signals emerging from the Israeli side have contributed to the sense of confusion driving the crisis, during which Israeli ministers have reportedly overruled warnings from senior security officials about the risk of stoking a widening confrontation with the installation of the devices. As other ministers warned of the risk of ‘large scale volatility’, Israel deployed thousands of extra troops to the West Bank. The UN security council will also hold closed-door talks on Monday about the spiralling violence after Egypt, France and Sweden sought a meeting to “urgently discuss how calls for de-escalation in Jerusalem can be supported”. In his Sunday sermon in St Peter’s Square in Rome, Pope Francis told worshippers he was following “with trepidation the grave tensions and violence” at the holy site as he appealed for ‘moderation and dialogue’. In a further indication of the hardening of positions, the Muslim authorities that oversee al-Aqsa said they would continue to oppose any new Israeli-imposed measures. 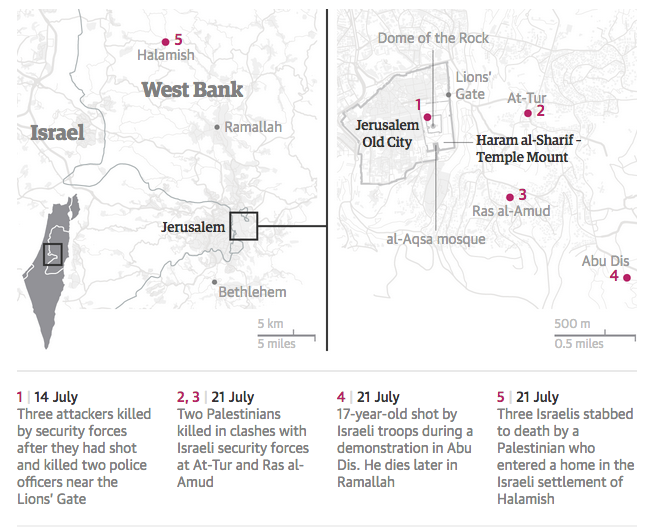 The issue exploded into more serious violence on Friday, after days of night-time clashes after the metal detectors, installation, which followed the attack on 14 July that killed two Israeli policemen at the entrance to the site by three Israeli Arabs who Israel says smuggled weapons into the compound. The sheer scale of the risks involved was made clear on Sunday morning when the Palestinian president, Mahmoud Abbas – who has long threatened to end security cooperation with Israel – cancelled a planned security meeting after announcing he was cutting all contacts. At the centre of the issue has been two competing impetuses. The first has been the politics of Israel’s right/far-right coalition, led by Netanyahu, which, say critics, led his cabinet to ignore warnings from senior security officials when deciding to install the metal detectors. The second is centred on the profound Palestinian religious, national and cultural sensitivities around the compound. 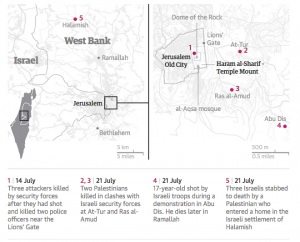 And at the centre of the violence has been a deadly miscalculation by the Netanyahu government that bridged both issues in which police recommended the installation of the metal detectors in the immediate aftermath of the 14 July attack. Persuaded by the idea it would play well with rightwing politicians and voters who had had called for Israel to impose further sovereignty over the site, Netanyahu ignored reported warnings from other security officials, including the Shin Bet domestic intelligence agency, that it could spark bloodshed. Compounding the error, say critics, Israel also failed to discuss the issue with officials of the waqf – the Jordanian religious institution that administers the compound. On the Palestinian side the issue is visceral. Captured by Israel in 1967, the site – regarded by most of the international community as “occupied” although claimed by Israel – is seen as a centre of Palestinian national identity that exists above both factional politics and disagreements over strategy. A unifying idea, its significance as a national symbol is embraced by secular and religious, making it one of the conflict’s most dangerous flashpoints. The location – as commentators on both sides have been quick to point out – triggered the Second Intifada in 2000 after a similar Israeli political misjudgment when then opposition leader Ariel Sharon visited the site. Justifying their suspicions about Israel’s motives, Palestinian religious officials and worshippers have pointed to their past experience over the Ibrahimi mosque-Tomb of the Patriarchs site in northern West Bank city of Hebron where they claim similar measures were used by Israel to control access.